Ukraine's Foreign Ministry condemns official contacts of the Syrian Arab Republic (SAR) with the occupation administration of the Autonomous Republic of Crimea and sent a corresponding note. 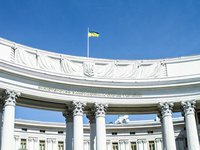 "The Foreign Ministry of Ukraine declares that Syrian officials conducting negotiations with representatives of the occupation authorities of Crimea, including the conclusion of the so-called 'Memorandum of Cooperation between the Crimean 'Council of Ministers' and the SAR Cabinet in the trade and economic sphere,' is a gross violation of the state sovereignty of Ukraine, interference in its internal affairs, as well as violation of the fundamental norms and principles of international law [...] The corresponding note of protest from the Foreign Ministry of Ukraine was transferred to the Syrian side," the Foreign Ministry said on Thursday. The Ukrainian Foreign Ministry emphasizes that the aforementioned illegal actions of the Syrian side, with which "the Syrian authorities are trying to please the current Russian regime," cause irreparable harm to diplomatic relations between Ukraine and Syria. The Foreign Ministry recalled that on October 15-16 in SAR, at the invitation of the Minister of Economic Development and Foreign Trade of Syria, there was a so-called "official delegation" of the occupation authorities of Crimea, along with the so-called "head" of Crimea Sergei Aksyonov.